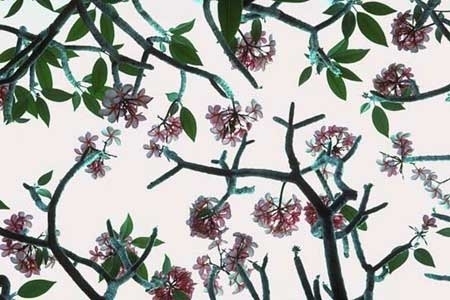 In Hawaii, plumeria grows in shrub size; in Tahiti, they grow tree size. This plumeria was photographed on an overcast day. I overexposed the slide to have the gray sky go to white and simultaneously bring the color of the flowers and branches out of shadow. This image can be ordered either horizontally or vertically.